Janellis have been developing and implementing versions of this toolkit in a diverse range of organisations around the world for the past 10 years. The toolkit is an integrated set of analysis, planning and briefing tools, used by response teams during an incident, emergency or crisis. This suite of crisis management tools can be easily customised for the unique requirements of each organisation. Our expert facilitators use these tools during exercises and training to build crisis management capability by developing critical thinking, both individually and as a group. The tools can be provided in a ‘Handbook’ that provides consistency and clarity where a ‘significant and coordinated’ response is required involving a number of teams or regions. They may also be provided on a digital platform and available on any mobile device – see Digital Platforms. We also recommend the use of a Capability Health Check tool for on-going reviews of capability across the various parts of your business – see Assurance Tools. 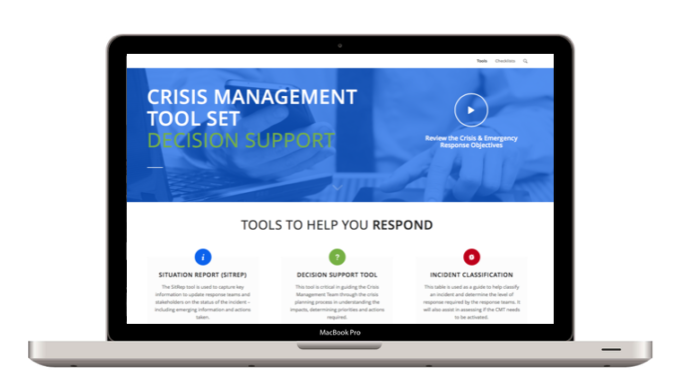 The tool details the triggers and thresholds for each level of response and is the first step in determining ‘is it a crisis?’ and which teams should be activated. This tool provides a structured and consistent process for response teams to assess the situation, determine the likely impacts and create an action and communication plan for their response. The Situation Report Template assists teams and individuals to prepare consistent, concise and clear briefings and status updates for the relevant teams and key stakeholders during an event. The Action Plan is crafted by teams working through the Decision Support Tool. The output is an agreed set of actions with a clear indication of resources required, expected timeframes and key stakeholders to be informed. This template helps structure the analysis and reporting at the conclusion of an event back to the teams and to other key stakeholders. It allows for lessons learnt to be captured and communicated. Our digital solutions allow resilience and crisis management capability to be accessed online and our assurance tools provide stakeholders with insights into the currency and adequacy of existing capability. Digital solutions are transforming the way businesses operate. Our custom-designed online platforms can communicate emergency and crisis management information to a broad group of stakeholders on multiple devices – for both training and response purposes. Our digital crisis management solutions also aid teams in being agile and informed in crisis situations. This includes rapid notifications, access to internal data, media information and resources – assisting teams to communicate efficiently, effectively and make critical decisions. From resilience portals to help your teams access critical information in plans, to online decision support tools that are available 24/7 on handheld devices. Our solutions give key decision makers access to the right information at the right time. Greater levels of assurance are being sought by key stakeholders that teams and organisations have the capability to respond and resilience reporting is being used to assess the capacity and capability for specific assets and across the enterprise.